This view by Lewis Josselyn shows Harrison Johnston at the 9th green during the 1929 U.S. Men's Amateur with large galleries at Pebble Beach. Over looking Carmel Beach and Carmel Bay. 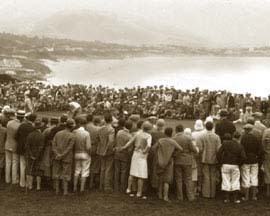 We have photos of Bobby Jones, Bing Crosby, Bob Hope, Sam Snead, Lawson Little, Ben Hogan, Jack Nicklaus, Phil Harris, Jack Lemmon to name just a few Pro-Am's that played Pebble Beach. Crosby tournaments he played at Pebble Beach. 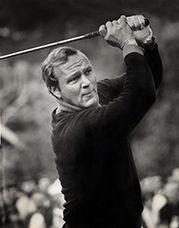 We also have photos of the rustic Log Lodge built in 1909 and burned in December of 1917 and early golfing at Old Del Monte as well as Pebble Beach from the Bing Crosby's golf tournament and clambakes from 1947 to the 1960's. And photos of the Tule Elk, buffalo and sheep when they roamed Pebble Beach. 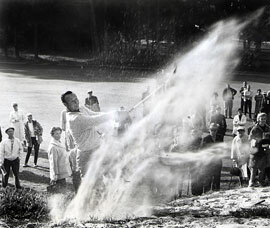 Other photos of Pebble Beach by J.P. Graham. Holdings: over 28,000 Photos of Monterey County listed in our database. Prints are available from 11x14" - 40x60" inches. A list of books, magazine and television programs that have used photos.